Habit: Solanum erianthum grows as a medium shrub to small tree up to 5 m in height. The leaves are arranged alternately, to 35 cm in length, ovate to elliptic, with an acute leaf apex and entire leaf margin. All vegetative and reproductive structures are covered with a dense tomentose covering of white stellate hairs. The actinomorphic flowers are arranged cymes. The calyx has 5 unfused greenish sepals. The corolla has 5 unfused white petals. There are 5 stamens with yellow anthers. The ovary is superior with 2 locules and numerous seeds. The fruit is a berry that turns yellow-orange at maturity. Habitat: Solanum erianthum grows in human disturbed habitats, exposed limestone Dry Broadleaf Evergreen Formation-Shrublands (scrublands), and Pine Woodlands. Distribution in Bahamas/Globally: Solanum erianthum occurs on all island groups in the Bahamian Archipelago as well as throughout the new world. Solanum erianthum is thought to originally be from Asia but is widespread throughout the globe. It is considered naturalized not weedy or invasive. 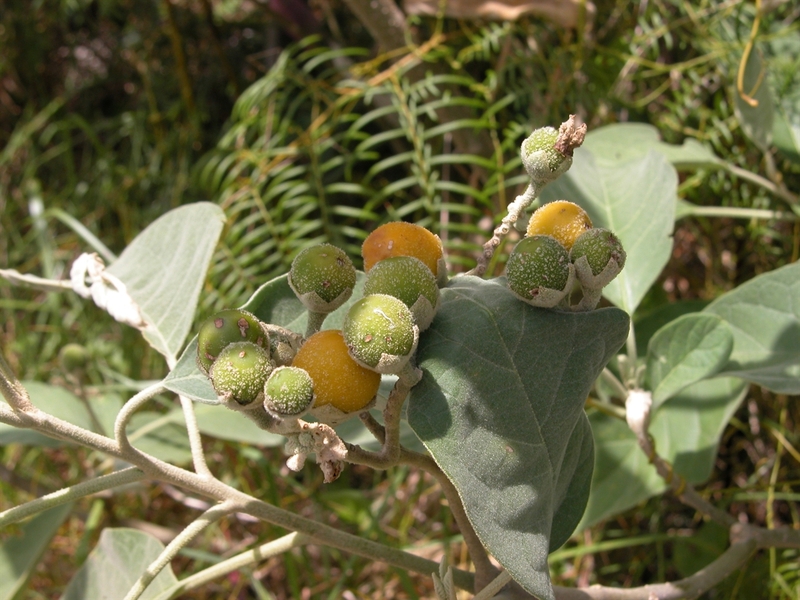 Medicinal/Cultural/Economic usage: Solanum erianthum is used in the Bahamas for dermatological problems (irritation or sores) and coughs. It is also drunk as a tea. Solanum erianthum is used in Central America to clean hands and dishes as well as stop headaches.